Phylogenetic hypothesis based on Hackett et al. (2008). Traditionally, Pelecaniformes also includes the family Phaethontidae (tropicbirds), which is only distantly related to the other families. 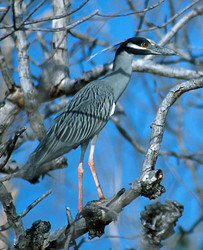 Several families included here are traditionally considered to belong to Ciconiiformes: Threskiornithidae, Ardeidae, Balaeniceps, and Scopus (Hackett et al. 2008). Cracraft, J. 1985. Monophyly and the phylogenetic relationships of the Pelecaniformes: a numerical cladistic analysis. Auk 102: 834-853. Fain, M. G., and P. Houde. 2004. Parallel radiations in the primary clades of birds. Evolution 58:2558-2573. Hedges, S. B., and Sibley, C. G. 1994. Molecules vs. morphology in avian evolution: The case of the "pelecaniform" birds. Proc. Natl. Acad. Sci. USA 91: 9861-9865. Johnsgaard, P. A. 1993. 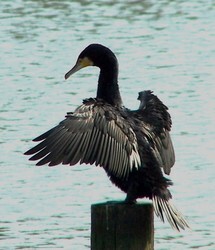 Cormorants, Darters, and Pelicans of the World. Smithsonian Institution Press, Washington DC. Kennedy, M., Holland, B.R., Gray, R.D., and Spencer, H.G. 2005. Untangling long branches: Identifying conflicting phylogenetic signals a priori using spectral analysis, neighbor-net, and consensus networks. Systematic Biology 54:620-633. Kennedy, M. and H. G. Spencer. 2004. Phylogenies of the frigatebirds (Fregatidae) and tropicbirds (Phaethontidae), two divergent groups of the traditional order Pelecaniformes, inferred from mitochondrial DNA sequences. Molecular Phylogenetics and Evolution 31:31-38. Kennedy, M., H. G. Spencer, and R. D. Gray. 2000. Hop, step and gape: do the social displays of the Pelecaniformes reflect phylogeny? Animal Behaviour 51: 273-291. Livezey, B. C., and R. L. Zusi. 2007. Higher-order phylogeny of modern birds (Theropoda, Aves: Neornithes) based on comparative anatomy. II. Analysis and discussion. Zool. J. Linn. Soc. 149:1-95. Mayr, G. 2003. On the phylogenetic relationships of trogons (Aves, Trogonidae). J. Avian Biol. 34:81-88. Nelson, J. B. 2006. 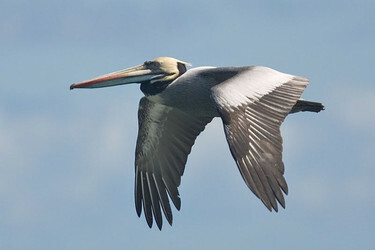 Pelicans, Cormorants, and Their Relatives: The Pelecaniformes. Bird Families of the World. Oxford University Press, Oxford, New York. Sheldon, F. H. and B. Slikas. 1997. Advances in Ciconiiform Systematics. Colonial Waterbirds 20(1):106-114. Siegel-Causey, D. 1997. Phylogeny of the Pelecaniformes: molecular systematics of a privative group. Pp 159-171 in Mindell, D. P. (ed. ), Avian Molecular Evolution and Systematics. Academic Press, San Diego. van Tuinen, M., D. B. Butvill, J. A. W. Kirsch, and S. B. Hedges. 2001. Convergence and divergence in the evolution of aquatic birds. Proc. R. Soc. Lond. B 268:1345-1350. Page: Tree of Life Pelecaniformes. Authored by Joseph W. Brown and John Harshman. The TEXT of this page is licensed under the Creative Commons Attribution-NonCommercial License - Version 3.0. Note that images and other media featured on this page are each governed by their own license, and they may or may not be available for reuse. Click on an image or a media link to access the media data window, which provides the relevant licensing information. For the general terms and conditions of ToL material reuse and redistribution, please see the Tree of Life Copyright Policies.